Cook brown rice according to package directions. After rice is cooked, preheat oven to 350 degrees. Drain and rinse canned beans and mix in with rice. Add garlic powder, cumin and salsa. Remove seeds from jalepeno (unless you like things really hot ) and dice into small pieces. Dice tomato and add to rice mixture along with jalepeno and cilantro. Mix well. Cut tops off of green peppers and fill with stuffing, dividing evenly between peppers. There should still be some room left in the peppers for the cheese after you are done. 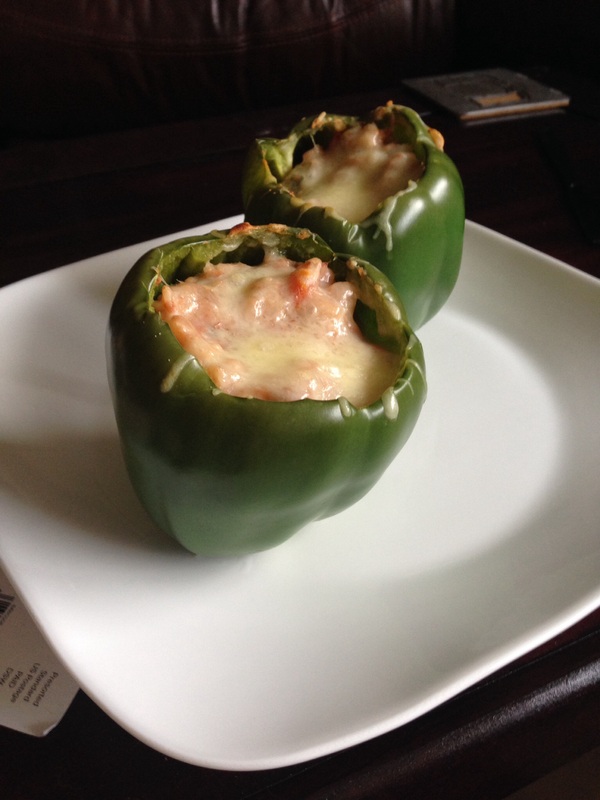 Top each pepper with 1/4 cup cheese. Fill a shallow baking dish with about one half inch of water. Place peppers in dish and bake for about 25 minutes or until peppers reach desired softness. Tip- if you just want to just make 2 or 3 peppers you can still make the same amount of rice mixture and save whatever you can’t fit into the peppers for lunch the next day. Cook quinoa according to package directions. While quinoa is cooking, stab holes in your sweet potato with a fork and cook in the microwave on high for about 8 minutes. Make sure you let the sweet potato cool down for a few minutes and then peel and dice into square inches. 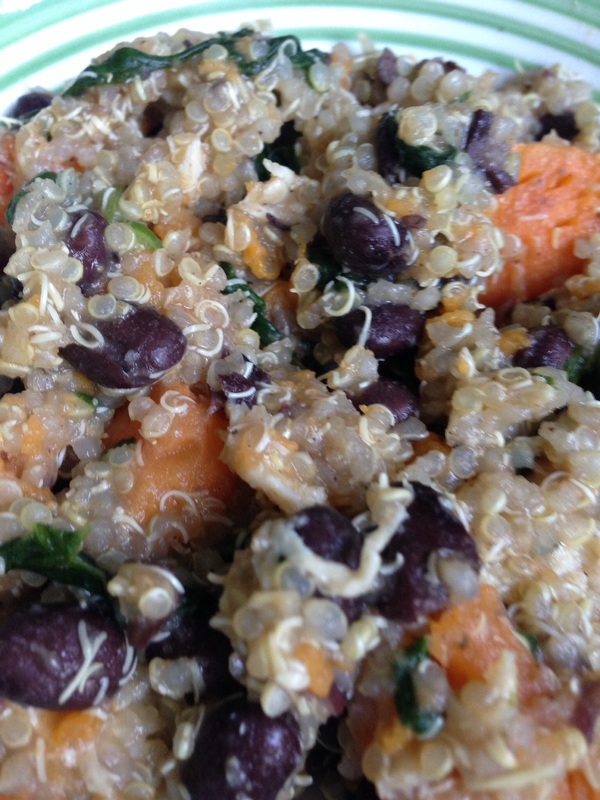 When quinoa is finished cooking add the beans, chicken breast, cumin, black pepper and orange juice. Mix thoroughly. Make sure the quinoa mixture is still warm and add the spinach and fold in until spinach shrinks and becomes wilted. Add the sweet potatoes and a dash of salt if needed. 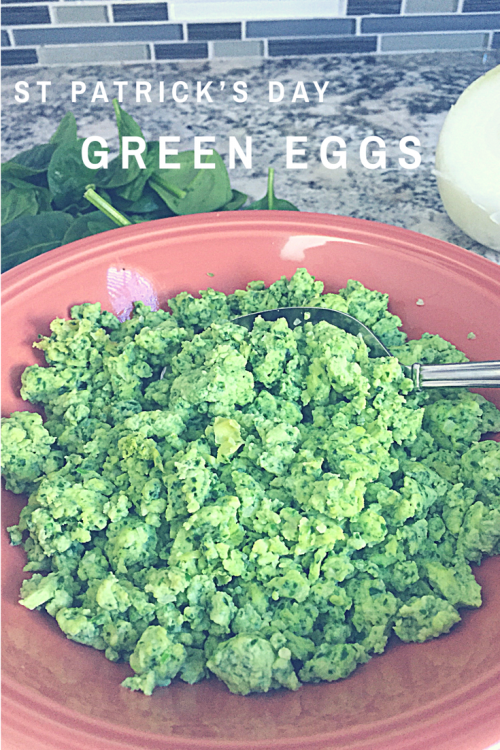 St. Patrick’s Day is coming up so I thought it would be fun to make some green eggs for breakfast. 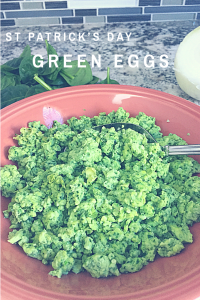 Instead of using green food dye I used spinach (much more healthy) to color my eggs. This way I can add a different flavor plus some extra vitamins and minerals such as vitamin A and K, folate, potassium, iron, and magnesium to my morning eggs! 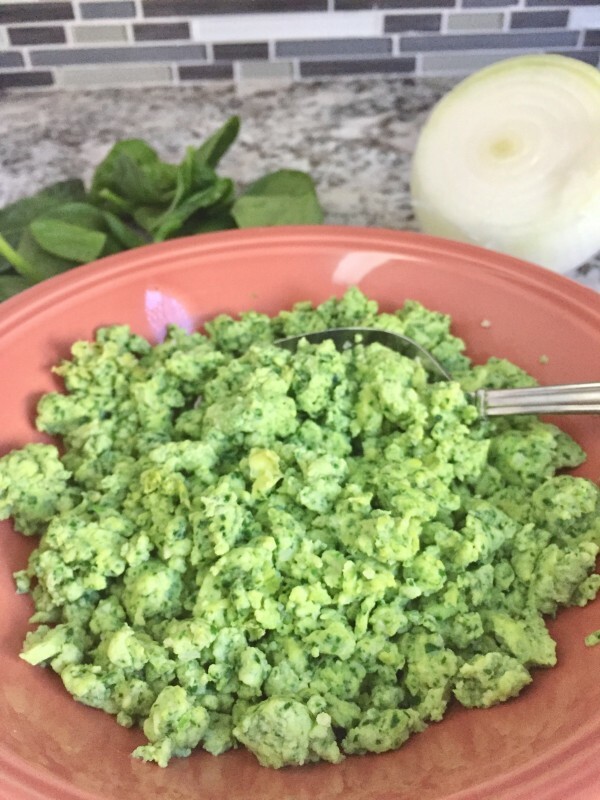 Eating spinach may also help decrease your risk of certain cancers and heart disease… so why not turn those eggs green? This recipe is so easy. 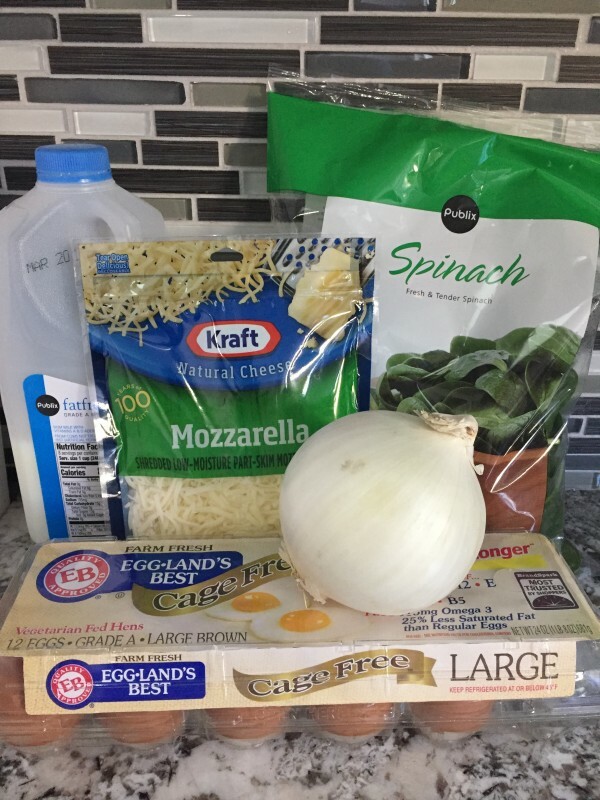 Basically you just throw everything in a blender or food processor for a few seconds and then scramble the egg mixture on the stove. Easy peasy. Blend all ingredients in a food processor or blender just until consistent throughout. Turn stove burner on medium heat and lightly spray a medium sauté pan with oil or cooking spray. Add egg mixture when pan heats up. Scramble eggs with a fork on medium heat for a few minutes until fully cooked. Divide into two portions and serve. 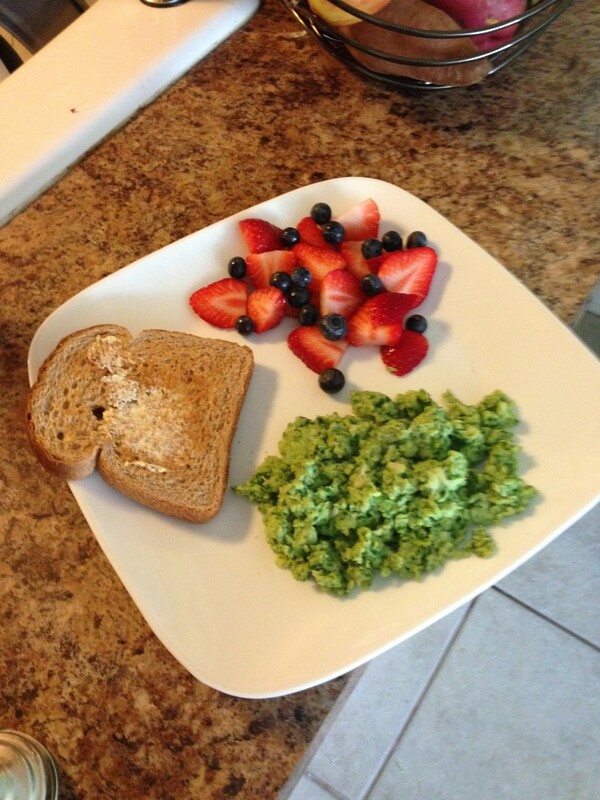 Add some fresh fruit and a slice of whole grain toast for a complete breakfast!